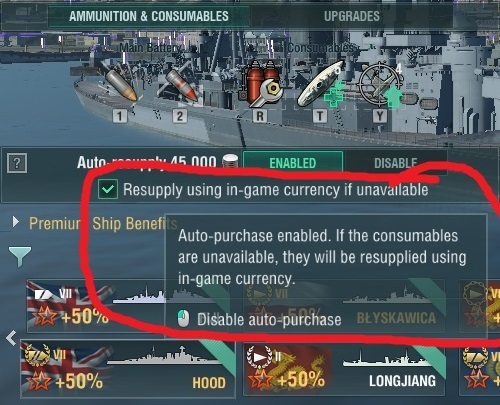 This has probably been asked a plethora of times but im a little eluded as to how to enable auto re-supply on consumables that i have in lieu free from collected containers without hemorrhaging doubloons? (Honestly forgetting to check count/ go back to port nearly every time). Also find it quite cheeky that they unwillingly carry on charging for extra of said rare camouflage's if set auto re-supply set, yet you cannot purchase said rare camouflages at will. Undesired condition/ pretty much typical laundering. Of my personal opinion and financial position i would say i spend a fair amount as it is. How to auto re-supply your consumables without it costing you money, or why are you being charged money for camo you can't buy in the premium shop? Assuming I understood your question correctly. If you want to disable auto-resupply when your stock runs out, uncheck that option. 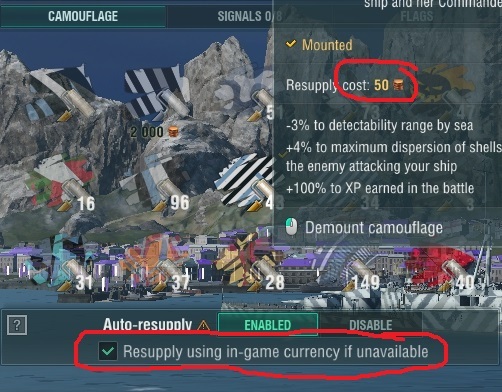 If you want to choose to resupply the consumables using credits instead of doubloons, right click the consumable of your choice and there should be an option for you to choose between buying with doubloons or with credits. There are a couple of special camos that can be bought using doubloons as far as I know, one is the Type 6 (50 doubloons), another is the Type 59 (125 doubloons). To not accidentally spend doubloons to resupply these camos, it's either you keep track of how many of them you have left, or you disable auto-resupply and manually mount them before each battle. If the tick box isn't there, then you can't buy it, instead, you will have to earn it from containers or missions. About that green camo, the closest I can think of is the Frosty Fir Tree that gives +100% XP, +125% commander XP and +50% free XP bonuses. And no, you cannot buy it with doubloons or credits. AFAIK there are only 3 +200% exp camos. None of them are green. Type 59. Can be bought for 125 doubloons. Spring Sky. You could earn 3 of these from recent missions. Can not be bought. Asian Lantern. You could earn 3 of these from recent missions. Can not be bought. Kinda cheeky but i have always activate auto only on the 3 default credit based camo only just to be safe.